Azulejos are the beautiful painted tin-glazed ceramic tiles that cover the walls of Portuguese cities. They are mostly to be seen on the façades of churches, schools, theaters, train stations or important buildings, but also on ordinary houses, which don't seem to have anything special, but probably belonged to rich families in the past. 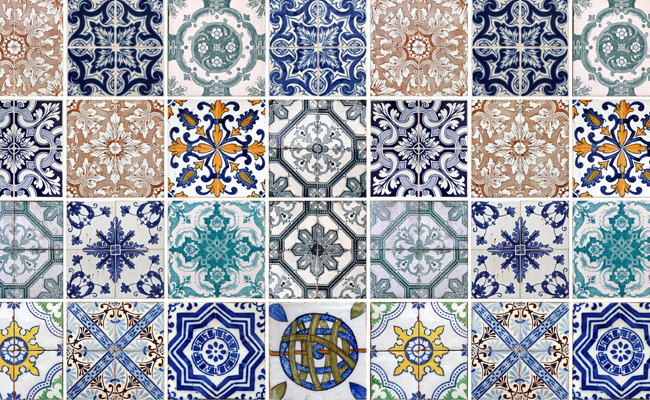 Many people think that the word "azulejo" is related to "azul", which means blue in Spanish and Portuguese. It is true that most of the famous Portuguese tilework is blue, but the true origins of the word come from the arabic azzelij (or al zuleycha, al zuléija, al zulaiju, al zulaco) which means "little polished stone". It is a technique that was already used during the Antiquity in Ancient Egypt and Mesopotamia, not only for decoration purposes, but also to protect buildings from the warm climate of these regions. Azulejos are thus one of the numerous traces left by the Moors in the Iberian Peninsula. Back then, azulejos consisted in mosaiques of colored ceramic tiles cut in geometric forms and put together to form a pattern. A very famous example of this technique can still be seen in the Alhambra in Granada. It is only in 1503, after a visit to Sevilla, that King Manuel I introduced azulejos into Portugal. The country first continued to rely on the export from other countries. Meanwhile, in Italy, artists had personalized their production of azulejos and started to use the tiles as a base to paint biblical scenes on. This had a great influence on what would later become a typically Portuguese art. Indeed, by the 17th and 18th century, Portuguese azulejos were produced in mass. It had extended to Brazil and the other colonies. After that, the reconstruction of Lisbon after the earthquake of 1755 gave rise to a more utilitarian role for decoration with azulejos, which is the most visible one today in the capital. The Museu Nacional do Azulejo in Lisbon holds the largest collection of Portuguese tiles in the world.